Intel today introduced a range of new eighth-generation Core processors [PDF] appropriate for future MacBook Pro, Mac mini, and iMac models. The most notable new chip is the first-ever Core i9 processor for notebooks. With six cores and 12 threads, Intel says the Core i9 is the highest-performance notebook processor it has ever designed. The H-series processor has a 2.9GHz base clock speed with a Turbo Boost frequency of up to 4.8GHz. Given the Core i9 is a 45W chip, it is appropriate for the high-end 15-inch MacBook Pro and could be included in a refreshed version of the notebook as early as this year. Apple last updated the MacBook Pro lineup with Kaby Lake processors at WWDC in June 2017, so a Core i9 model could debut at WWDC 2018. Of note, while the Core i9 processor allows for systems with up to 32GB of RAM, this is unlikely to apply to the next MacBook Pro, since low-power DDR4 RAM is still not supported. Back in 2016, Apple's marketing chief Phil Schiller said 32GB of standard DDR4 RAM would compromise battery life. The eighth-generation Core processor family also includes new quad-core Core i5 and Core i7 processors with base clock speeds between 2.3GHz and 2.7GHz and integrated Iris Plus graphics. These 28W chips, part of the U-series, are suitable for future 13-inch MacBook Pro and Mac mini models. Intel says the new Core i9, i7, and i5 processors for notebooks are based on its Coffee Lake platform and leverage its 14nm++ manufacturing process, enabling the chips to deliver up to 41 percent more frames per second in gameplay or edit 4K video up to 59 percent faster than the previous generation with the same discrete graphics, based on its internal benchmark testing. As with Intel's Kaby Lake Refresh processors introduced last August, these new Coffee Lake chips pave the way for a quad-core 13-inch MacBook Pro should Apple choose to release one. The current lineup is limited to dual-core models. Intel also expanded its lineup of eighth-generation Core processors for desktops today after an initial rollout last October. Two chips suitable for future 4K and 5K standard iMac models include six-core Core i5-8600 and Core i5-8500 chips with base clock speeds of 3.1GHz and 3.0GHz respectively. The desktop lineup also includes six lower-power 35W chips with four or six cores and base clock speeds between 2.1GHz and 3.2GHz. While the current Mac mini lineup uses 28W chips, previous generations have used up to 45W chips, so the 35W processors could be suitable for future Mac mini models. All in all, Intel has potentially laid the groundwork for a high-performance, top-of-the-line 15-inch MacBook Pro, quad-core 13-inch MacBook Pro models, a long-overdue Mac mini refresh, and updated iMacs as early as this year. Looking further ahead, Bloomberg News on Monday reported that Apple plans to design and use its own processors for Macs starting as early as 2020. Intel shares saw their biggest price drop in two years following the report. I don't care if it 'compromises battery life', I know what I'm getting into. 32GB is not a luxury anymore, it's needed for anyone who does heavy development work on the go. 90% of the time, I'm powered, anyway; the laptop just gives me the freedom to take that power anywhere. MacMini?? Macrumors is a bit late for April fools' day joke. What’s the deal with Intel dragging its feet to include lpddr4? There have been plenty of other processors in recent years that have been passed over. 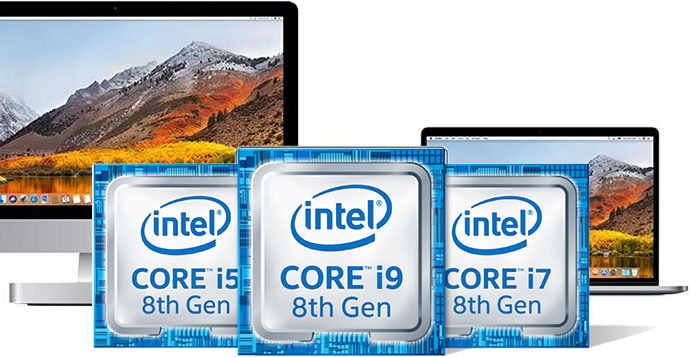 And how often has a processor been announced by Intel and then Apple adds it in a new laptop 2 months later? Not gonna happen with this round of refreshes. If you think this is bad, wait until Apple tries to sell you a Mac with some mobile grade Arm processor, lol. I mean, really, just take the components straight out of the MBP put them in a little box and majority of people will be SUPER happy. Yet Apple will be the one blamed if they use this chip in the next MBP and only include 16GB RAM.